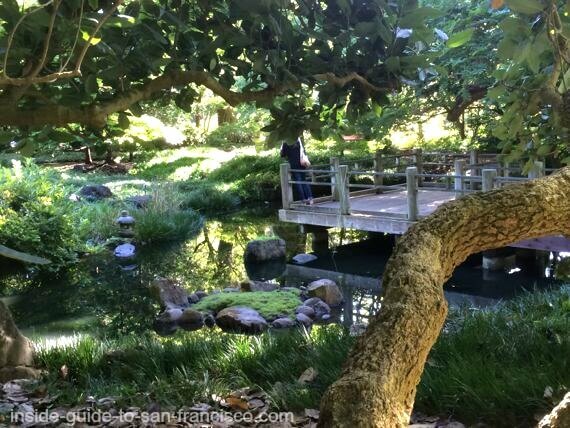 The Botanical Garden in San Francisco is a wonderfully serene place to explore, located in the heart of Golden Gate Park. 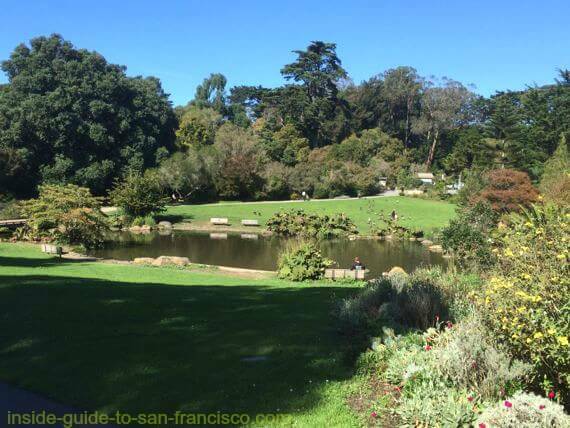 The gardens, often referred to by locals as the Arboretum, focus on plants that are adapted to climates similar to San Francisco's: a quasi-Mediterranean climate with a heavy dash of cool fog. 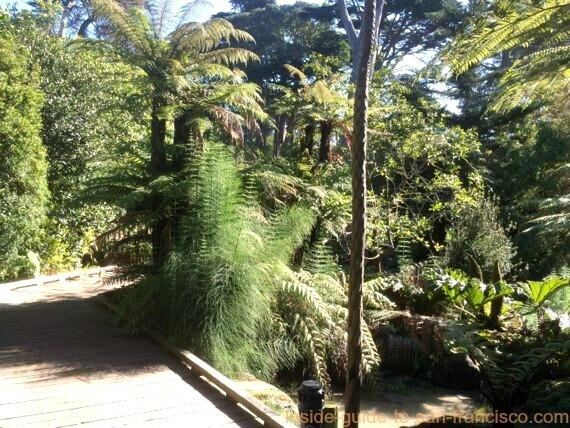 There are 55 acres of greenery to explore, including around 8,000 species of plants from all over the world. The botanical gardens are organized by geographical region. 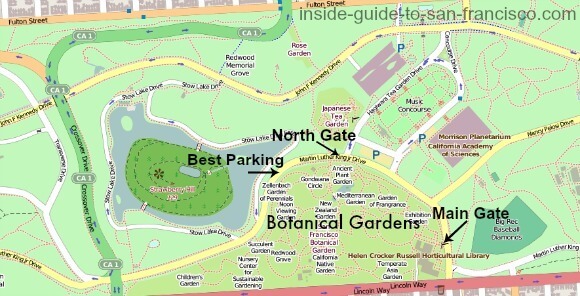 There are two entrances to the garden: the Main Entrance and the North Entrance (see maps below). At either entrance, you can pick up a map of the gardens and some brochures about the features. 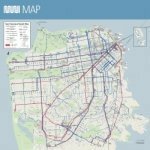 Once you have your map, you can decide which of the areas you want to see, or just ramble around and be surprised. This is a mysterious spot with a wooden platform suspended over a pond, surrounded by gnarled tree trunks. This garden was inspired by the Japanese custom of tsukimi, or viewing the moon, where during the warm months of August and September, friends and family would gather in a garden after dark to eat, hear music, perform tea ceremonies, and recite poems to the moon. Charming! The Moon Viewing Garden is also available for weddings. A waterfall cascades over stones to join the pool at the Moon Viewing Garden. 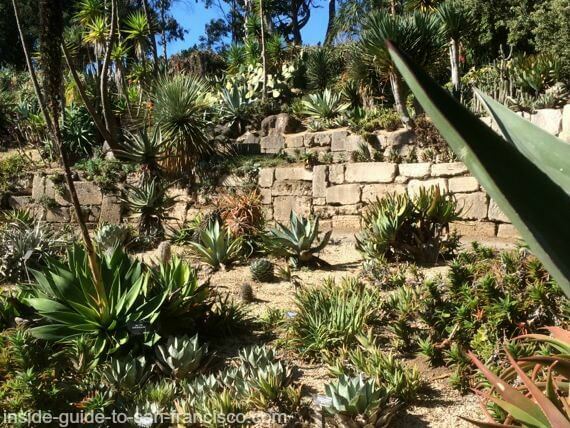 Large collection of succulents in all sizes. 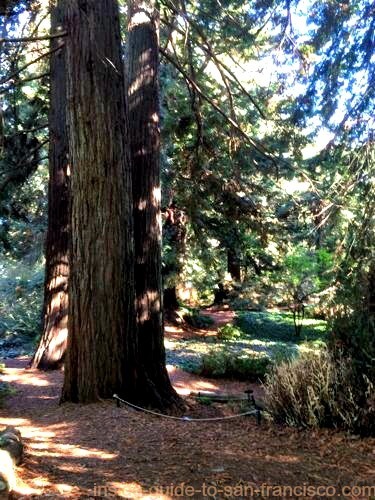 Peaceful and shady grove of redwoods that have been growing here since around 1900. Sniff your way around the collection. 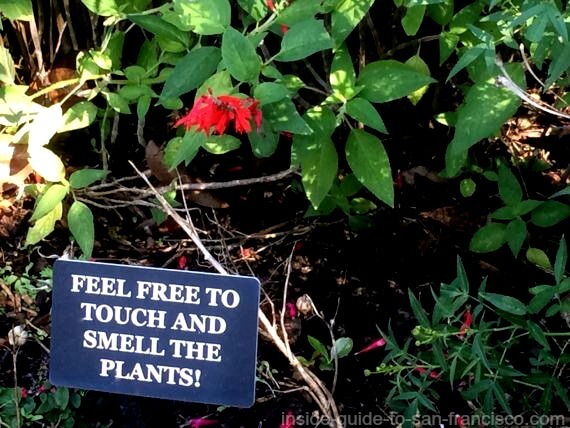 Lavender, Salvia, Pelargoniums, and more. Start in the Early Devonian period, 416 million years ago, and work your way to the plants of the Eocene epoch, 56 million years ago. One of the things that I like to do is to explore the little paths and stairways leading off the main paths; it feels rather magical to come upon a waterfall or stone structure that you weren't expecting. There are lots of little offshoots that beckon! Bathrooms. There are only two restrooms, and the gardens are large; they are located near the two entrances. The no-no's: no pets (except guide dogs), no camping, no smoking, no bikes, roller skates or skateboards. Docent tours: daily at 1:30, main gate. Friday, Saturday, Sunday at 2:00, north gate. Bird walk: first Sunday every month at 8:00 a.m.
Picnics: visitors are welcome to bring food and enjoy the garden, but be sure to clean up after. Coyotes. As you may have heard, coyotes have moved into the parks in San Francisco, and Golden Gate Park is one of their favorite spots. I asked a couple of the gardeners here about them and they told me there are coyotes in the botanical garden, but they've only seen them in the early morning hours, around 6:30 a.m. They apparently get in by digging under the fences; the staff have seen their paw prints, as well as the coyotes themselves, one or two at a time. The experts say they don't represent a danger to people, but don't approach them, in the unlikely event that you see one. 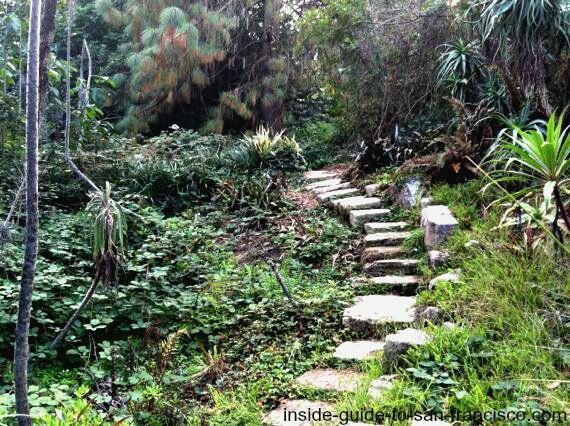 Spring (April-May): California Native Garden, Rhododendron Garden, South African Garden. 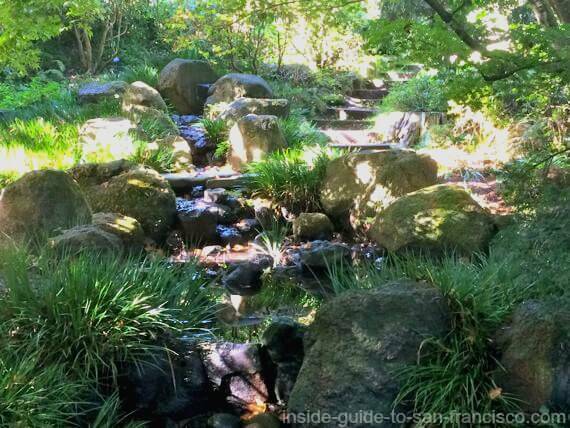 Summer (June-September): Zellerbach Garden perennials, Garden of Fragrance, Redwood Grove. Fall (October-December): Mesoamerican Cloud Forest, Andean Cloud Forest, Moon Viewing Garden. Winter (January-March): Magnolias, Camellia and Rhododendron Gardens, Succulent and South African Gardens. Of course, spring is the best time to see the flowers here. San Francisco residents (with ID): free. Free days for everyone: second Tuesday of each month, Thanksgiving, Christmas and New Years Day. Always free entry from 7:30 to 9:00 a.m. Closing is seasonal: closes one hour after last entry. Spring and Summer (second Sunday in March through September): last entry at 6 p.m.
Fall and Winter (first Sunday in November through January):last entry at 4 p.m.
October: last entry at 5:00 p.m. The Main Entrance to the Arboretum is on Martin Luther King Drive, just inside Golden Gate Park at 9th Avenue. The North Entrance is also on Martin Luther King Drive, a little farther into the park. 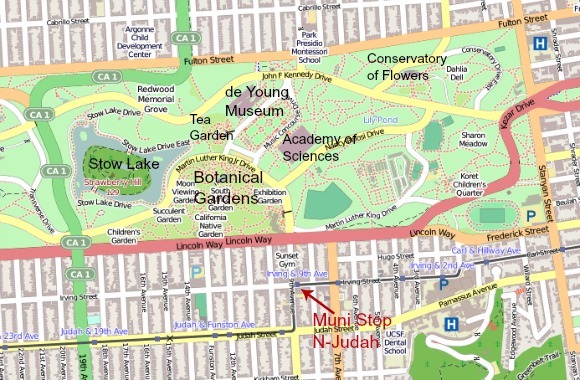 The best parking opportunities are on Martin Luther King Drive between the North Entrance and Stow Lake (see map). It's easy to get there on the street car. The N-Judah stops on 9th Avenue and Irving Street, a block from the park entrance; you can catch it downtown along Market Street (underground- it's a subway downtown). More flowers? Visit the Conservatory of Flowers not far away. Golden Gate Park has lots of other gardens, as well. 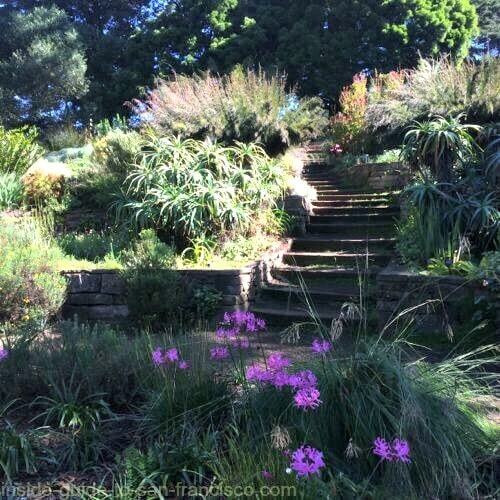 Explore the Rose Garden, Shakespeare Garden, Rhododendron Dell and more at Gardens in Golden Gate Park. Plus a map of all the garden locations.